1. An abnormality on ultrasound is not clearly defined and more information is sought in order to make a decision about therapy, delivery, or to advise a family about prognosis. Example indications include a potential anomaly in the setting of maternal obesity, oligohydramnios, or advanced gestational age. 2. An abnormality is identifed on ultrasonography and the treating physician desires MR-specific information in order to make decisions about care. An example might include the calculation of MR-derived fetal lung volumes in cases of congenital diaphragmatic hernia. 3. A fetus is significantly at risk for abnormality that will affect prognosis even if no finding is discovered with ultrasound, eg neurologic ischemia after laser ablation of placental anastomoses in Twin-Twin Transfusion Syndrome. 4. Claustrophobia. Many women who are concerned about claustrophobia can be coaxed through an examination with patience, the consolation of a family member of friend holding their hand in the MR unit, supplemental oxygen, repositioning into decubitus position, and/or the use of diversions including eye coverings/DVD viewers. 1. Screening for ferromagnetic devices or implants is negative in the mother. 2. Gestational age: Currently there are no specific guidelines from the FDA. However, imaging in the first trimester is not recommended as this is the time of organogenesis. ACR suggests imaging after 18 weeks due to the unknown effects of higher magnetic field strength and potentially prolonged imaging times (CLICK HERE FOR CURRENT ACR-SPR guidelines). However, no current evidence exists to show that fetal MRI is harmful to either the mother or fetus. 3. Appropriate indication for the fetal MRI. 4. The use of gadolinium has not been adequately studied in pregnant human subjects and is not used during pregnancy unless absolutely clinically necessary, especially during organogenesis. 5. Ultrasound imaging is complementary to fetal MRI and is helpful at the time of the MR imaging. For some centers, ultrasound is not possible, and in this situation, it is helpful to have a report and/or images from recent ultrasonography for correlation of biometric measurements and anatomy. MRI is a powerful complement to ultrasound for the evaluation of a variety of fetal and placental abnormalities. It is also a primary modality choice for unexpected maternal maladies that may arise in pregnancy. The primary advantages of MRI include high spatial resolution and excellent soft tissue contrast while still being noninvasive and void of ionizing radiation. Regardless, a discussion of several safety aspects of MRI including exposure of the fetus to electromagnetic energy from the static magnetic field, radiofrequency (RF) pulses and rapidly changing gradients is warranted. The initial safety issue is that of exposure of the fetus to the static magnetic field [1,2]. Numerous animal model studies are present in the literature. Some have shown general deleterious embryonic effects such as upon development of embryos, delay and reduction in hatching rates, fetal loss, decreased crown rump length (CRL); additional studies have demonstrated organ specific disturbances in the development of the chick cerebellar cortex and murine eyes [3-8]. Other animal studies have shown no such embryonic effects, including a study using human fetal lung fibroblasts . There are no studies in the literature that have reproducibly proven a deleterious biologic effect by static magnetic fields on human tissue [2,10]. While in vivo studies are understandably lacking, Kanal et al, in a survey of nearly 1500 pregnant MRI staff, found no statistically significant adverse pregnancy outcomes including fertility with exposure up to 4.7T . Another safety issue is that of exposure of the fetus to excitatory radiofrequency energy and its inherent potential for tissue heating. Inherent to this issue is the potential teratogenicity of fever to the developing fetus . A parameter for safety that is used is the specific absorption rate (SAR), defined as a measure of the rate of energy absorption by the body when exposed to radiofrequency electromagnetic field. The FDA and other international agencies have published SAR limits for whole body and local body, but it remains uncertain as to if the fetus should be considered a part of the mother or a separate individual. In one study, use of T2 HASTE, the foundation of fetal imaging, produced no significant temperature increase in the fetal brain or amniotic fluid of a pig model. And in a pregnant model, in normal mode at 1.5 T and 3.0T, the calculated temperature increase and SAR limits were found to be within a safe range [13,14]. There is however a report in the literature using a similar pregnant model where using maternal SAR limits may not protect the fetus from overexposure . Another common safety concern is that of the use of rapid time varying electromagnetic fields (MR gradients) raising two issues: exposure to the gradients themselves and the acoustic noise created by the gradients. Limited research is available on isolated exposure to gradients, none of which have shown adverse effects with in vitro cellular studies [16,17]. More significant literature exists regarding high levels of acoustic exposure. Recent literature suggests that high levels of repeat sound exposure during pregnancy may produce low birth weights, shorter gestation and hearing loss . The FDA limits sound intensity to 140dB in the MRI suite. The exact degree and frequency of sound attenuation as a function of gestational age is not known. Some level of sound attenuation however does occur in utero with attenuation more significant at higher frequencies offering the fetus some protections [19-21]. Exposure of the fetus to MRI at 1.5T in the second and third trimester has not been associated with hearing abnormality in several studies [22-25]. And finally, numerous studies evaluating longer term outcomes have also demonstrated no abnormalities in functional outcomes and birth weight for children exposed to in utero MRI [11,22,23,25-27]. While rarely encountered in women of child-bearing age, all contraindications that apply to non-pregnant patients apply during pregnancy. These include implanted medical devices such as pacemakers, especially when the patient is pacer dependent . medical devices that contain ferromagnetic material are also contraindications. Usual screening procedures customary to all MRI programs must be applied. The ACR recommends that MRI screening should be performed by at least two separate personnel, one of which should be a level 2 MRI personnel. Screening includes documentation with a standard paper questionnaire followed by confirmation with oral review. Manual screening by a ferromagnetic specific detection device (rather than a conventional metal detector) is advisable. As with all other patients, wearable metallic objects that can be removed should be removed prior to the MRI session, including piercings. All patients should be administered a gown supplied by the institution to be worn during the study and while in Zone III and IV. The reader is encouraged to review the ACR Guidance Document on MR Safe Practices: 2013 for further details. There are no absolute fetal or placental indications for the administration of intravenous gadolinium contrast agents (category C drug) and therefore administration of these agents for these specific indications is not usually indicated. While there is a report of a small number of patients administered gadolinium contrast in the first trimester, with none having experienced congenital defects, there is no literature to prove its fetal safety . Gadolinium agents are not known at this time to be teratogenic [29-34]. However these agents do enter fetal-placental circulation and amniotic fluid potentially creating an environment where dissociation of toxic free gadolinium may occur by way of delayed excretion [35-37]. Please note that gadolinium contrast agents may be considered in the rare instance of a serious maternal indication, a discussion beyond the scope of this section. Rocket Catheters: Rocket KCH Catheters are utilized for pleuro-amniotic, cyst-amniotic and vesico-amniotic shunts. Via the website: Rocket Medical plc. can confirm, that anecdotally, we are aware that the Rocket® KCH™ Catheter has been successfully used in conjunction with MRI. Since 2003, over 4,200 Rocket® KCH™ catheters have been inserted and it is believed that the majority of these have been subject to MRI screening. Although Rocket Medical plc. does not have access to the specific details of the conditions under which those scans were completed, we are not aware of any reports either received directly by the company or made to the UK Regulatory bodies (MHRA) or FDA of any adverse incident involving this device and MRI. The minimal mass of the austenitic marker rings is understood to be insufficient to create migration of the catheter under normal screening conditions. However a specific maximum MR-Conditional field density or strength cannot be validated or therefore recommended. The decision to use MRI screening must be taken in conjunction with qualified Radiological guidance and only on the basis of the clinical benefit versus the potential risk of screening. GOLDBAL2: These balloons are currently utilized for fetoscopic balloon occlusion in the presence of a severe congenital diaphragmatic hernia. The balloon have been scanned while in the fetal airway at both 1.5 T and 3T without known complication. There is as of yet a MR safety rating, which should be forthcoming in the near future. In summary, there is no evidence in the literature of harmful effects of MRI on the fetus and therefore no specific special considerations are needed once an attending radiologist has deemed the MRI study to be warranted. Such a decision should rely on a discussion with the referring physician and a careful review of pre-MRI data that clearly demonstrates its need. In general, fetal MRI has limited utility prior to 16-18 weeks due to the small size of the fetus and incomplete organogenesis and therefore should be performed sparingly in the first trimester. The literature does, however, maintain several important safety questions regarding fetal exposure to electromagnetic and sound energy for which the currently available data remains inconclusive. Continued studies are warranted that more definitively address all embryonic and fetal safety concerns related to MRI. 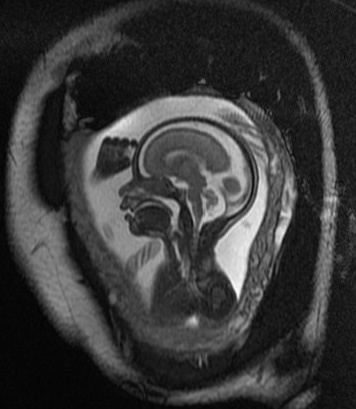 Normal Fetal brain: Magnetic Resonance Imaging. An atlas with anatomic correlations. N Girard, D Gambarelli; Brunelle and Shaw (2001). Fundamental and Advance Fetal Imaging: Ultrasound and MRI. Editors Beth Kline-Fath, Dorothy Bulas and Ray Bahado-Singh; Wolters Kluwer, (2015). For Fetal Biometry references please click here.